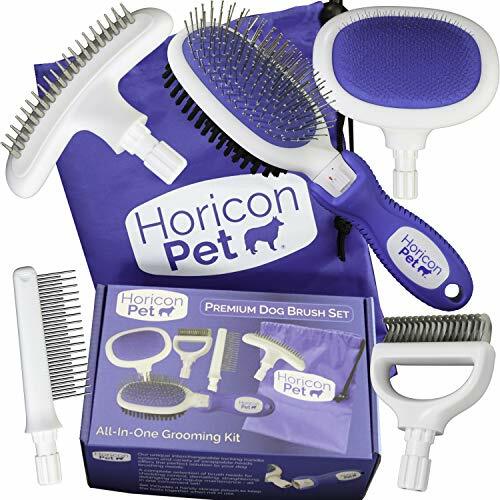 The Horicon Pet Premium Dog Brush Set has been designed to make brushing your dog an easy and enjoyable experience. We combined all of the most commonly used brushing and dematting tools in one high quality, compact kit. Our versatile assortment of tools is ideal for multiple pet households. All of the detachable brush heads and tools are made with a patented locking design that works with the included comfortable and ergonomic handle. Included in the kit are a traditional Slicker Brush and a versatile Spring Comb with alternating long and short rotating pins. A dual purpose head has a Ball Pin Brush with rounded tips to comfortably detangle fur and undercoat. The other side is a PVC Bristle Brush to brush the fur for optimum luster and shine! The pro-quality De-Matting Comb has specially designed stainless steel blades with deep curved edges to effectively remove knots, tangle and loose hair. It also combs painlessly through deep mats. The Deshedding Edge Comb is included as the perfect first step for brushing or as a basic daily maintenance tool! Finally, the Horicon Pet Premium Dog Brush Set includes a handy drawstring bag to keep everything neat and tidy when not in use! Whether you have a short haired or long haired dog, one dog or ten, this selection of tools will get the job done! Our goal is to always provide innovative solutions and value to you, our valued customer! Our brushing and grooming tools are durable, high quality components and are built to last! We stand behind our products with an Unconditional 100% Satisfaction Money Back Guarantee. Complete Dog Brush Set Has Every Brush You'll Need! Makes Brushing Your Dog Easy, Convenient and Fun! Includes Tools For Brushing, Dematting, Straightening, Detangling, And More! Each high quality tool locks securely into our comfortable handle in multiple positions. Convenient drawstring bag included to store all of the brushes when not in use! If you have any questions about this product by Horicon Pet, contact us by completing and submitting the form below. If you are looking for a specif part number, please include it with your message.